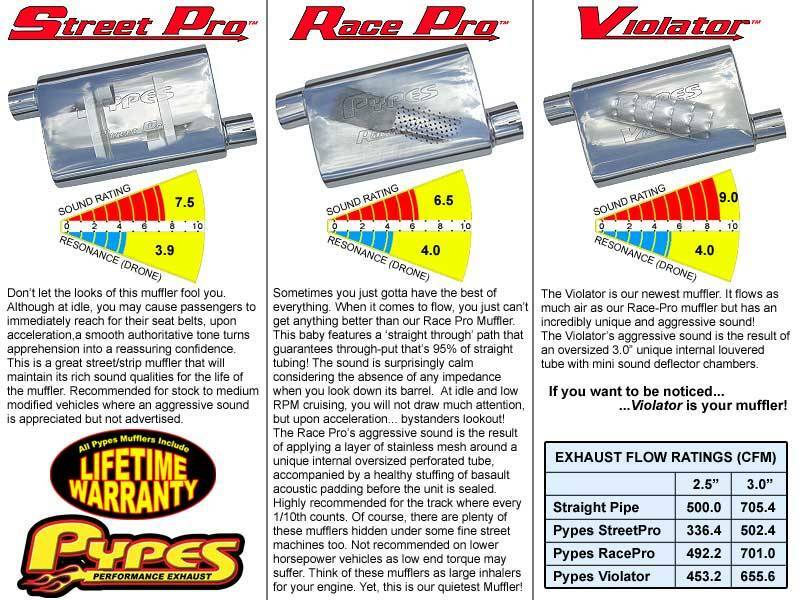 Choose a pair of Pypes mufflers to the right. Not for SRT8 cars! V8 only. 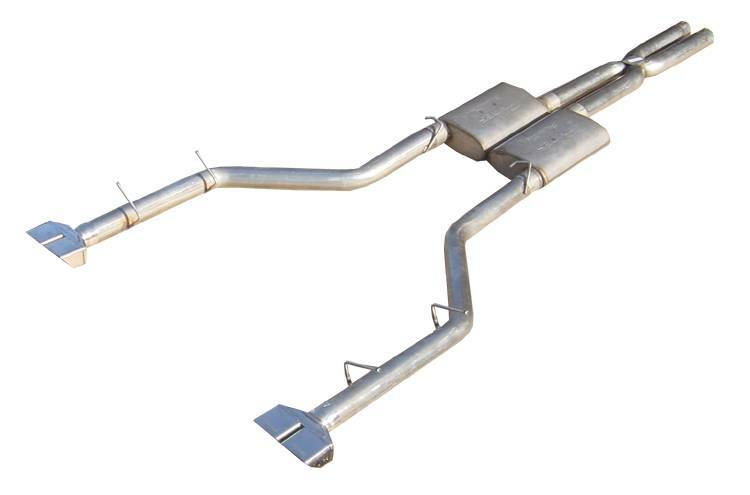 Includes all stainless siamese design X pipe, 1 piece slip fit tailpipes, Pypes mufflers, stainless band clamps, hangers, and polished stainless classic double box tips. No cutting or welding required! Increases horsepower by 10-18. The sound is awesome, the quality is great, very easy to install only tough part is lining up the tailpipes/tips. Took about an hr all together. I replaced a slp loudmouth it was to obnoxious, the violator is mello at idle an part throttle has a deep rich tone, but once you get on it wow! It sounds great. 2010 r/t. AEM cai, diablosport itune 1000. Quality, ease of install and great sound without drone. I actually bought this from Jegs with the Race Pro mufflers. 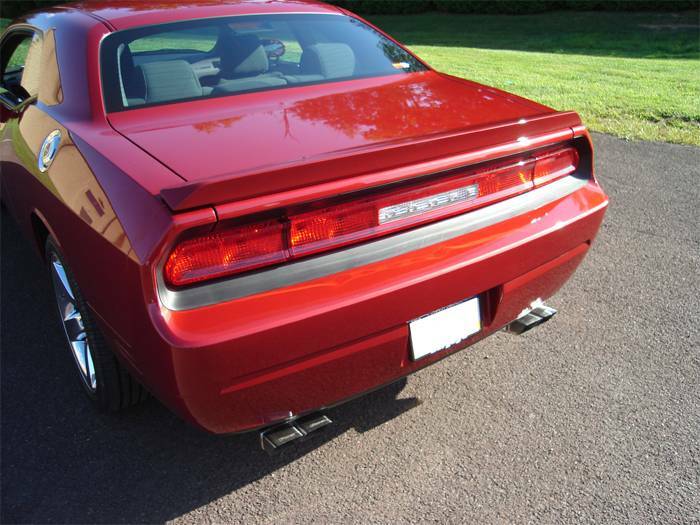 Installed on a 2012 Dodge Challenger R/T. Very pleased with this setup. First of all fhe build quality is excellent and only took anour an hour to install. The overall sound is perfect. It has an agressive sound on acceleration (sound rating of a 7) but while cruising it calms down to a nice low rumble (sound rating of a 4). And best of all there is zero drone even when the MDS kicks in. The tips protrude out the back too far and I had to cut the tail pipe. Cutting the tail pipe also made for a flimsy fit so I also had to cut longer and extra slots to be able to compress the tip with the clamp. Product is exactly what was described and I love the performance increase and sound. tips stick out a little further than I would like. I will have to do some trimming when I get time. Found that when installing all of the hangers were 1 3/8" to the rear and mufflers were hitting the drive shaft coulper at diff. Had to cut about 1 1/2" off the X-pipe to getn a good fit and the tips stick out to far for me and I may need to cut 1" off of the tail pipes to fit tips tighter to bumper cover.